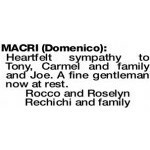 The Funeral Mass for Mr Domenico Macri of Fremantle will be celebrated in St Patrick's Basilica 47 Adelaide Street Fremantle commencing at 10:00AM on W EDNESDAY (24.04.2019). The cortege will leave the church at the conclusion of Mass and arrive at the main entrance of FREMANTLE Cemetery, Carrington Street, Palmyra at 11:30am for an Entombment service. Vigil Prayers and Rosary will be recited in Bowra & O'Dea Chapel 312 South Street, Hilton at 7:00PM on TUESDAY (23.04.2019). Deepest Sympathy to Tony, Joe, Carmel and families on your sad loss. Born Delianuova Italy 3.1.1924. Passed away peacefully at SJOG Murdoch on 11.4.2019 aged 95. Loving husband of Concetta (dec). Adored father of Tony and Joe. 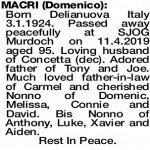 Much loved father-in-law of Carmel and cherished Nonno of Domenic, Melissa, Connie and David. Bis Nonno of Anthony, Luke, Xavier and Aiden. Family request no visitors to the home. You were a wonderful, devoted and respected father who lived for his family. The love you gave us can never be replaced. He moulded him with a heart of gold. His memories will never grow old. Rest Peacefully Dad. Tony, Joe and Carmel. To our adored Nonno, we are sad to say goodbye but you are forever in our hearts. 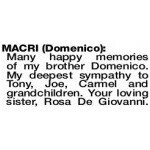 You were a loving Nonno and Bis Nonno and happiest surrounded by your family. We have fond memories of our time spent together and your endless jokes and stories. Rest Peacefully Nonno. Love always Domenic, Melissa, Connie, David, Anthony, Luke, Xavier and Aiden. 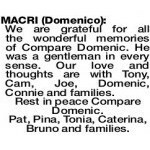 Many happy memories of my brother Domenico. 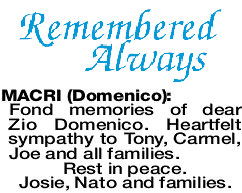 My deepest sympathy to Tony, Joe, Carmel and grandchildren. Your loving sister, Rosa De Giovanni. 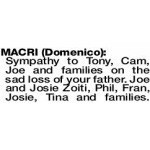 MACRI DOMENICO Deepest Sympathy to Tony, Joe, Carmel and Families on your sad loss. Domenico Costarella and Families. Our deepest sympathy to Tony, Carmel, Joe and all extended families for the sad loss of a true cousin, gentleman and friend. Antonio, Rosina, Cosmo and Josephine Cutri. 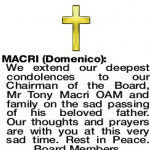 MACRI DOMENICO In loving memory of our dear Uncle Domenico. 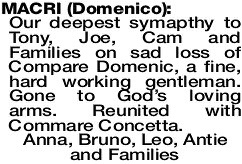 Heartfelt and deepest sympathy to cousins Tony, Carmel, Joe and families. John, Anna, Domenico, Domenica and Brad. 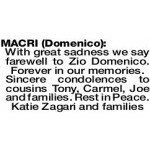 With great sadness we say farewell to Zio Domenico. Forever in our memories. 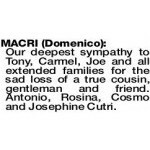 Sincere condolences to cousins Tony, Carmel, Joe and families. Rest in Peace. 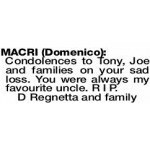 MACRI DOMENICO Deepest sympathy to Tony, Joe, Carmel, Domenic, Connie and family on the passing of Uncle Domenic. 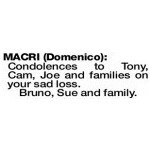 Joe and Carolyn Macri. 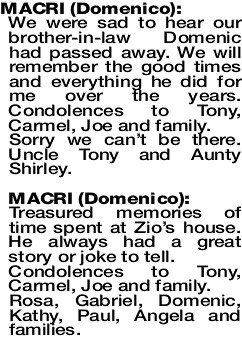 Our heartfelt sympathy to Tony, Joe, Carmel and families. 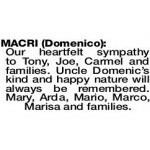 Uncle Domenic's kind and happy nature will always be remembered. Mary, Arda, Mario, Marco, Marisa and families. 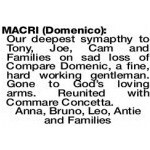 Our deepest symapthy to Tony, Joe, Cam and Families on sad loss of Compare Domenic, a fine, hard working gentleman. Gone to God's loving arms. Reunited with Commare Concetta. 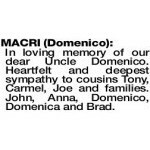 MACRI DOMENICO We were sad to hear our brother-in-law Domenic had passed away. We will remember the good times and everything he did for me over the years. 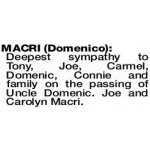 Condolences to Tony, Carmel, Joe and family. Sorry we can't be there. 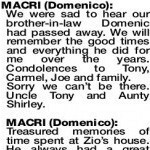 Uncle Tony and Aunty Shirley. Treasured memories of time spent at Zio's house. He always had a great story or joke to tell. 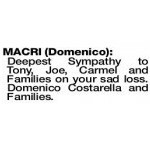 Condolences to Tony, Carmel, Joe and family. Rosa, Gabriel, Domenic, Kathy, Paul, Angela and families. Condolences to Tony, Joe and families on your sad loss. You were always my favourite uncle. 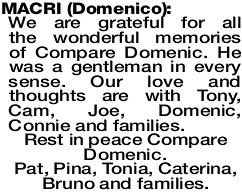 R I P.
We are grateful for all the wonderful memories of Compare Domenic. He was a gentleman in every sense. 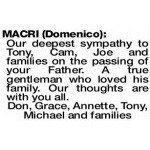 Our love and thoughts are with Tony, Cam, Joe, Domenic, Connie and families. 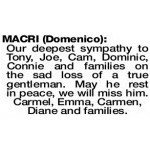 Rest in peace Compare Domenic. Pat, Pina, Tonia, Caterina, Bruno and families. 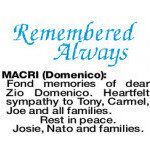 Fond memories of dear Zio Domenico. 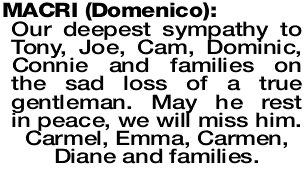 Heartfelt sympathy to Tony, Carmel, Joe and all families. Rest in peace. Josie, Nato and families. Heartfelt sympathy to Tony, Carmel and family and Joe. A fine gentleman now at rest. 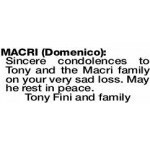 Sincere condolences to Tony and the Macri family on your very sad loss. May he rest in peace. 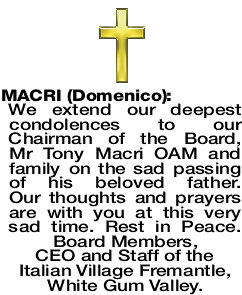 We extend our deepest condolences to our Chairman of the Board, Mr Tony Macri OAM and family on the sad passing of his beloved father. Our thoughts and prayers are with you at this very sad time. Rest in Peace. Board Members, CEO and Staff of the Italian Village Fremantle, White Gum Valley. 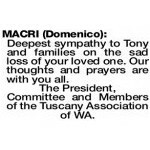 Deepest sympathy to Tony and families on the sad loss of your loved one. Our thoughts and prayers are with you all. 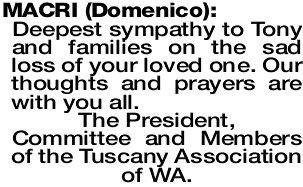 The President, Committee and Members of the Tuscany Association of WA. Our deepest sympathy to Tony, Joe, Cam, Dominic, Connie and families on the sad loss of a true gentleman. May he rest in peace, we will miss him. Carmel, Emma, Carmen, Diane and families. Our deepest sympathy to Tony, Cam, Joe and families on the passing of your Father. A true gentleman who loved his family. Our thoughts are with you all. 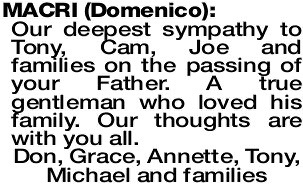 Sympathy to Tony, Cam, Joe and families on the sad loss of your father. Joe and Josie Zoiti, Phil, Fran, Josie, Tina and families. Condolences to Tony, Cam, Joe and families on your sad loss.